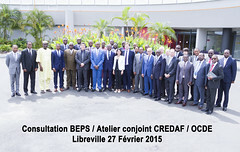 02/03/2015 - After the March 2014 meeting in Paris and following the release of the Strategy for Deepening Developing Country Engagement in the BEPS Project in November 2014, French-speaking countries met on 27 February 2015 in Libreville, Gabon. Over 40 tax officials from 13 countries, as well as representatives from regional and international organisations, attended the event which was hosted by the Gabonese revenue authority and jointly organised by the Centre de rencontre des administrations fiscales (CREDAF) and the OECD. The main topics of discussion were the base erosion issues which have specific relevance for the region and the development of toolkits in order to implement the measures designed to tackle BEPS. Representatives from businesses and civil society took part in the plenary of the meeting and had the opportunity to present their views on the BEPS Project. Intragroup payments (royalties, interests, remuneration of services). The co-chairs of the meeting, Mr. Claude Combo, Deputy Director of the revenue authority of Gabon, and Mr. Dieudonné Lokadi Moga, Director of the revenue authority of the Democratic Republic of Congo, wrote a summary of the discussions (only available in French). These will be discussed at the meeting of the Task Force on Tax and Development in Paris on 16-18 March 2015, and will feed the development of the BEPS Project outputs, as well as the work of the Committee on Fiscal Affairs and its Working Parties.